家具跌落试验机/指导方法操作/厂家现场测试沙发或家具在运输和安装时发生碰撞时的整体强度 将沙发的一端抬高离地面75 毫米, 100 毫米, 150 毫米或200 毫米,让其自由落下并让沙发脚或轮子碰撞地面. 将沙发的一端抬高离地面75 毫米, 100 毫米, 150 毫米或200 毫米,让其自由落下并让沙发脚或轮子碰撞地面. 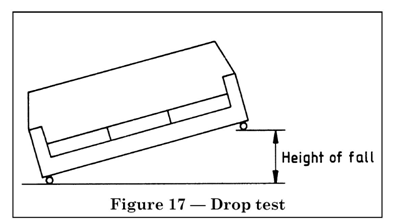 中英对照： Lift up the article at one end and then allow to fall freely from the appropriate height so that the impacting feet or castors strike on the floor. Drop height 75 mm, 100 mm, 150 mm, & 200 mm.